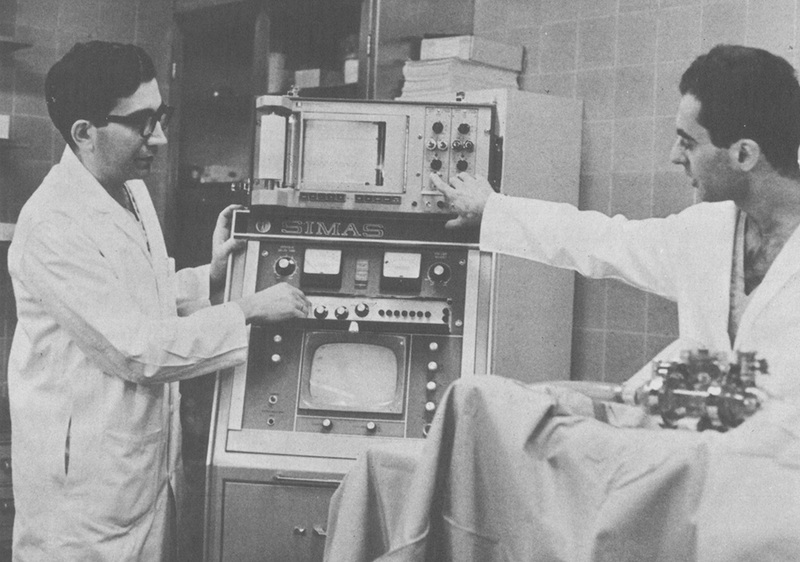 Technician José Ruiz (left) and Dr. Francisco Merino, a Canadian Research Fellow, demonstrate the computerized heart-assist pump that was used at the JGH in 1968. 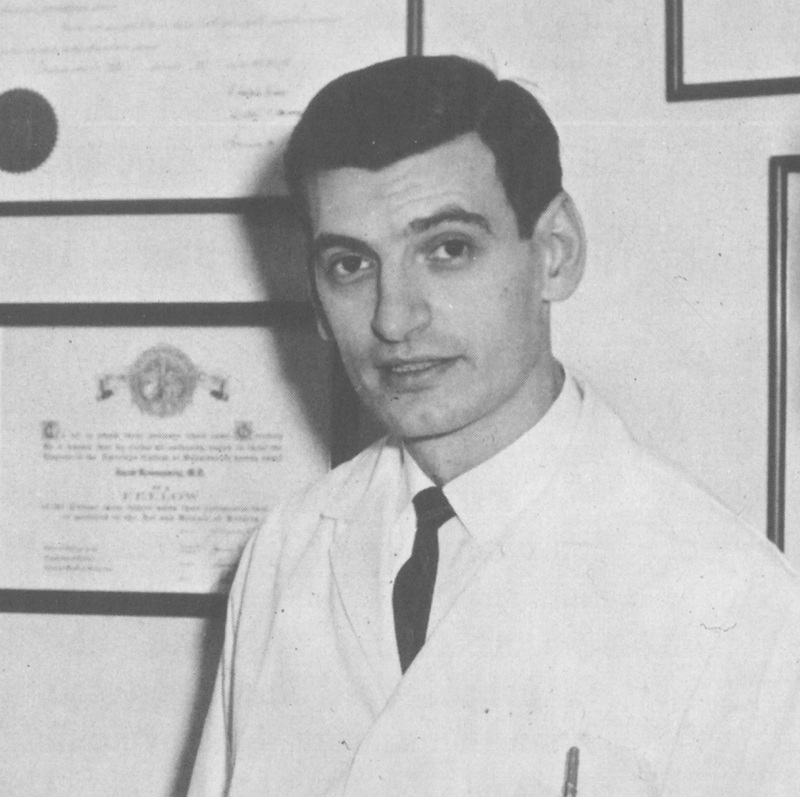 In January 1968, the JGH made medical history as the first hospital in the world to use an external, artificial heart-assist pump to resuscitate a patient who was dying of an acute heart attack. 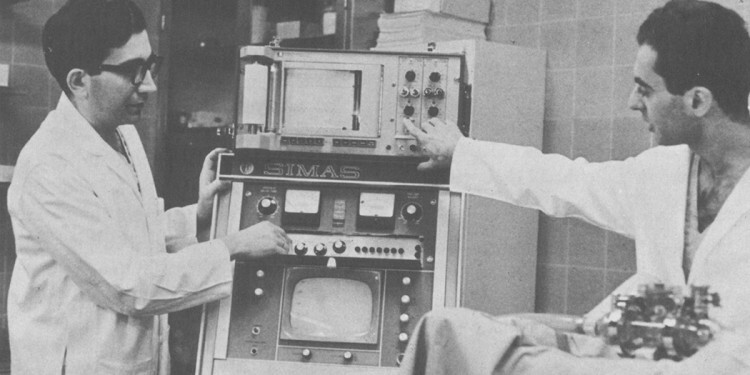 The pump was controlled by a computer, whose medical use was uncommon at that time. The patient, a 47-year-old Montreal sales executive, was admitted on New Year’s Day with an acute coronary occlusion. His condition deteriorated rapidly over the next several days, to the point where his lungs became congested with fluid and, eventually, his pulse and blood pressure nearly disappeared. Recognizing the gravity of the situation, the patient’s physician, Dr. Michael Gold, Senior Physician at the JGH, quickly met with cardiologists Dr. Sydney Segall and Dr. Albert Lapin, all of whom agreed on using the computer-controlled heart-assist pump on a human for the first time. The pump, which reduced the heart’s workload and increased bloodflow to the coronary arteries, had been acquired by the hospital in 1963. However, like similar models in hospitals elsewhere, it had previously been used only experimentally on animals. In late February, just under two months after conducting the procedure, Dr. Jacob Rosensweig, Associate Surgeon and Director of Experimental Surgery at the JGH, proudly announced that the patient was health enough to be discharged. The Jewish General Hospital’s 85th anniversary is an ideal occasion to take a glimpse into the past. 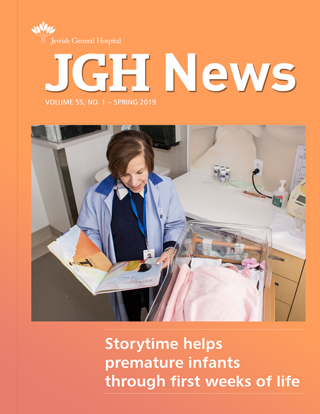 By remembering the extraordinary efforts of the hospital’s founders, supporters, staff and volunteers, we honour the enduring legacy of the JGH. Look for a new scrapbook item every week during 2019 in JGH News.